Published: March 12, 2013 at 12:54 p.m. Updated: March 12, 2013 at 05:11 p.m. The Atlanta Falcons kept working on changing Tony Gonzalez's mind, whittling away at the "95 percent chance" that the tight end would retire. All that work has paid off. 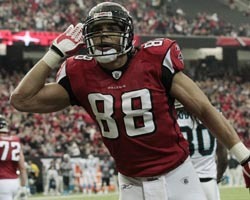 Take a look at photos of Tony Gonzalez through the years. Fox Sports insider and NFL Network contributor Jay Glazer reported Tuesday that Gonzalez has informed the Falcons he is coming back, and the sides are working on a new contract. Gonzalez later confirmed via Twitter he'll return next season. "After discussing it with my family and really, truly struggling with this decision I informed the Falcons I would like to return for one more shot," Gonzalez told Glazer. Gonzalez later wrote on Twitter: "The lure of being on such a great team and organization, along with unbelievable fan support was too good to pass up." Falcons general manager Thomas Dimitroff, via a team release officially announcing the move Tuesday, said Gonzalez's exemplary attitude has paid dividends. "Tony has been vital to our success over the last four seasons and we are excited that he has decided to return for a fifth season," Dimitroff said. "He is a great teammate and is a leader of our football team on the field and in the community. Tony leads by example and his professionalism has paid dividends across our entire organization." Dimitroff later appeared on NFL Network and called doing a contract with Gonzalez a formality. Gonzo is the best tight end available in a deep market, but he wasn't interested in shopping his wares to other teams. The Falcons were prepared for this moment; they created salary-cap room by releasing veterans like Dunta Robinson, John Abraham and Michael Turner. Gonzalez is older than all of them, but he's also playing at a Pro Bowl level. The Falcons' offense still could use a running back, but their passing game should remain dynamic with Gonzalez sandwiched between wide receivers Julio Jones and Roddy White. "It's great -- for Atlanta and for the NFL," Falcons owner Arthur Blank told NFL.com's Steve Wyche in a text message.